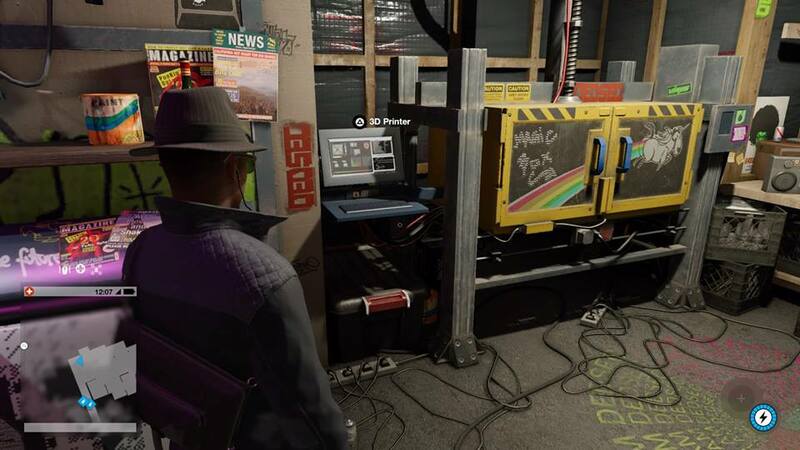 Welcome to Watch Dogs 2, brought to you by Ubisoft. 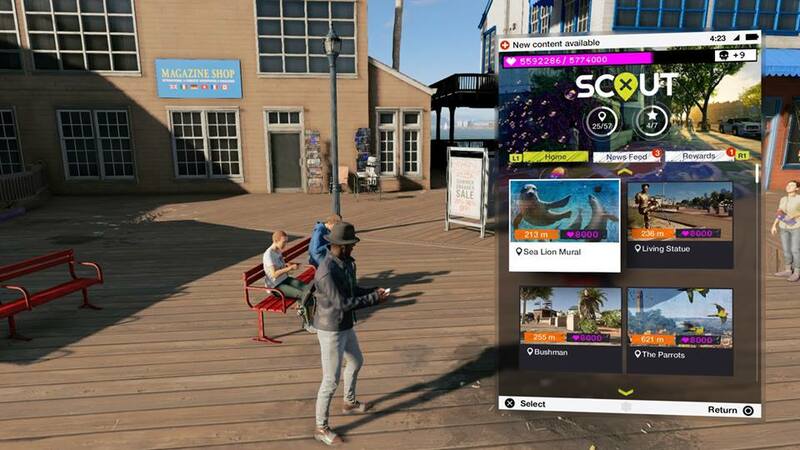 Watch Dogs 2 is an open-world adventure set in San Francisco. You explore as Marcus Holloway, who is part of a hacking group called Dedsec. You are joined by Wrench, Josh, Sitara, Horatio and Ray, and together you must try to take down Blume’s operation. 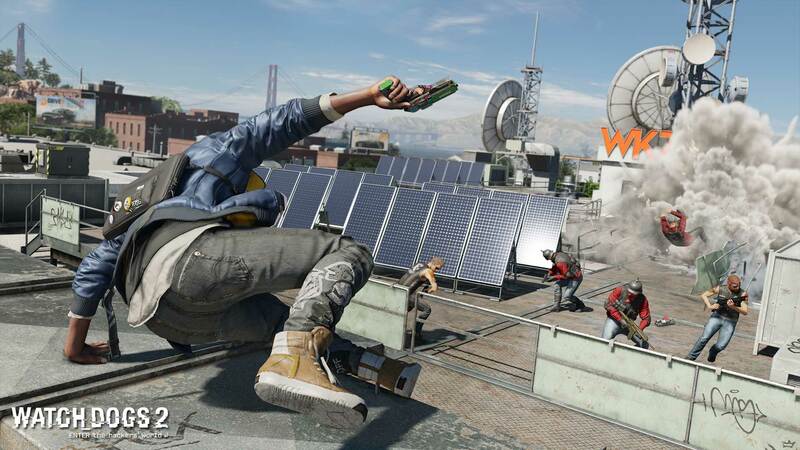 The trophies in Watch Dogs 2 are a lot easier than its predecessor. They’re mostly story-related trophies, along with a few collectible-related ones. There are four online trophies, but these shouldn’t take that long to get. To do the online trophies, make sure your preferences are set to ON. Once you are done, you can switch them all off to stop people jumping into your session. To do this, press to bring your phone out, then press on game options > settings > online preferences. Step 1: Complete the side missions (trophy related) as well as the main missions. Here you want to simply go through and enjoy the story. The game is designed with stealth in mind, so take this opportunity to explore the areas with the RC and Quadcopter plotting your routes to avoid being spotted. The stun gun is your main friend here, so I would highly advise getting the upgrade for it (Stun Amp Up in the Marksmanship tree). If that isn’t to your liking, there is always plan B going in with guns. However, a word of warning: you will likely die a lot, as you can only take up around 2-5 bullets before you are killed. Step 2: Miscellaneous trophy clean up. You will probably get some of these trophies while going through the main story missions. If for some reason you don’t, then use this step to clean up any remaining miscellaneous trophies you are missing. Free roam is still available after finishing the main story. All you should have left now are the online trophies (also possibly One of the Gang ) If you still have One of the Gang left, it’s said that playing in co-op will make these events spawn, so use this step to try for this trophy as well. Other than that here you will be hacking, invading, doing bounties and playing a co-op mission. As ever, collect every other trophy to add this platinum to your collection. Story related, and cannot be missed. This is kind of like a short tutorial on how the game works. Your goal is to work your way through Blume’s building towards a laptop from which you erase your identity. Afterwards, you will have to escape the building. Once done, the trophy will pop. Once Marcus has infiltrated the Blume Building, he will be accepted into Dedsec. After the beach party, Marcus will wake up to a phone call from Sitara. After the phone call, simply fast travel ( )/travel to any clothes store in the area (t-shirt icon). Buy any bottoms from the store, and the trophy will unlock. These can be bought from any Plainstock Clothing Stores all over the city. 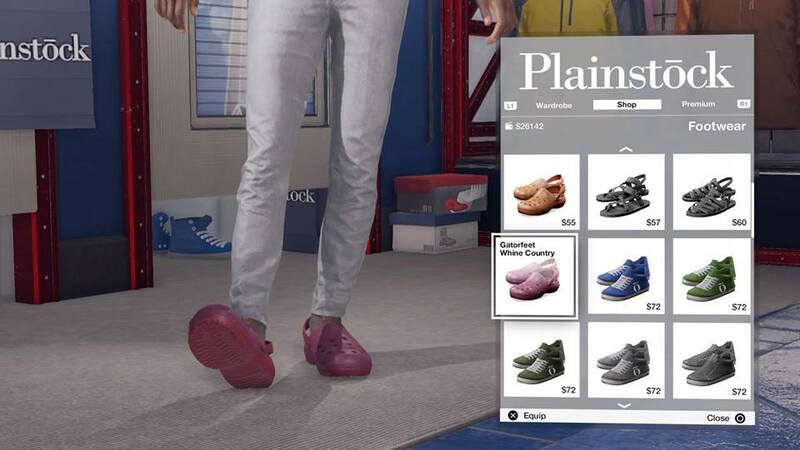 Simply fast travel to one, then once you are outside the store head towards the icon and then press Select shoes, and then scroll down until you see a pair of pink coloured shoes. To buy them hold down . The Gatorfeet Whine Country footwear will cost you $65. 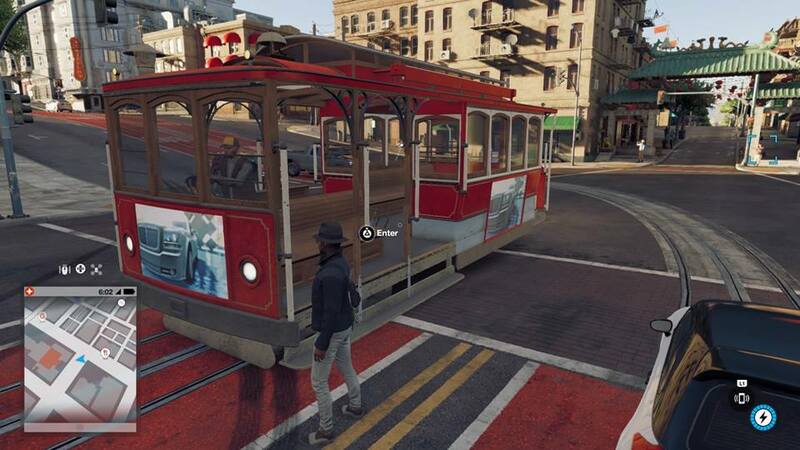 However, cable cars like the following shown below are not rideable; you can only unlock this trophy on the red cable cars. The Nudle building can be found in Silicon Valley. Fast travel to the building, and buy any shirt from any of the vending machines in the facility. You can also do this while you are on a mission, as you will be traveling to the Nudle building a few times during the story. Dogs can be found anywhere around the map. They are most commonly found in parks such as Golden Gate Park. Once you’ve found a dog press You can pet the same dog 10 times to unlock this trophy. Press and then select the camera from the menu. Once your camera is out, travel around until someone interrupts/makes a silly pose while you are taking a selfie. Once they interrupt you press to take a picture. There are 7 Unique Vehicles in the game. However, you only need to drive one of them in order for this trophy to unlock. These vehicles won’t count towards your One-Man Garage trophy. To hijack a boat, you first need to jump on it, then press To stop the boat you are hijacking, park your boat in its path. Taking boats that are not moving (i.e docked on a pier) won’t count for this trophy. The boats have to be moving. Buses can be found all around the San Francisco Bay Area. Once you’ve found a bus/coach, block its path to force it to stop, then press to enter it. The buses/coaches need to be moving, not parked. There are 24 Key Data to collect around the San Francisco Bay Area. They will be shown up on the map once you are in the vicinity. It’s recommended to have the RC and Quadcopter available to you. To get a pinpoint location, press > research > select the upgrade in question, then to show up on the map. Fast travel there (using the nearest option) and pull your Quadcopter out. Press to enter eagle vision to help you identify the area the Key Data is in. Some of the Key Data will be in hostile zones. Some you will be able to simply pick up, while others will require you to hack and solve a puzzle. Note that you just have to pick up the data for this trophy to unlock; you don’t need the upgrades that go with it. I highly recommend going for this while going through the story missions, as there are two or three opportunities to get this. You can use the Chopper Retreat Exploit Key Data upgrade to make life a little bit easier along with a fast car as well as the Engine Override upgrade (Nitro hold ). Start by shooting civilians until around level 4, then once the Police you will get to level 5. At this point, use your Chopper Retreat Exploit upgrade along with your Nitro to escape the Police. Try to find garage doors that you can open and close to hide in while you are in escape mode. You can either buy one from Elek Motors or hijack the car in question in order to gain this trophy. I would recommend you buy it, as it counts towards your 25 total; however, hijacking one will save you $43,125. To perform a stealth takedown, press once close to the enemy. It’s recommended to go stealth throughout your gameplay due to the cheapness of deaths you can endure. If you don’t get this during your story run-through, then you can either visit hostile zones on the map (red areas) to farm them, or you can jump into co-op mode and farm there. There is no in-game tracker for this. There is only one place to perform this which is near the Colt Tower in the San Francisco Area. It’s recommended you also have the fastest Motorcycle for this (the Sayonara) along with the Engine Override upgrade. You will need to purchase a sailboat in order to compete. This doesn’t have to be the fastest sailboat, as all you need to do is complete (not win) the race in question, so you can buy the cheapest. Once you’ve bought the sailboat, fast travel to any of the green boat icons and press to load up the race. Select Alcatraz Escape, as it’s the quickest to complete. Purchasing the boat will count towards your 25 vehicles bought. Robots will start to appear later on through the story. Once you see one, press and to hack it. You will most likely get this while playing through the story. If you don’t, San Francisco is the perfect place for this due to its downhill streets with humps in the road. This trophy requires some patience, and is best attempted during nighttime. Fast travel to the Bar located in Jack London Square located in Oakland, and keep looking for people drinking while staggering. If you see one, follow them with your phone out and if they lean forward in an L shape, quickly press to take a picture of them as they start vomiting. You will need to purchase the Vehicle Directional Hack from the research app (vehicle hacking tree) before you attempt this trophy. Once bought, head to the motorway or any straight piece of road jump on top of the vehicle and press and . These are random events that can occur during any point of your gameplay. You will know it’s a DedSec Event due to it flashing in the top left-hand corner along with a purple icon on your mini map. More often than not, there will also be another real world player going after that same event. It doesn’t matter who neutralises the target, so long as it’s complete. Once you’ve completed this trophy, you can exit the online session from the game settings in the menu. Bounty Hunter is a new mode in Watch Dogs, which is a PvP (Player vs Player) mode. Once you’ve triggered it from your phone, you will be tasked to escape the Police as well as killing the hunter. However, for this trophy to pop, you just need to kill the hunter. The easiest way to complete it is to head to one of the Hackerspace HQs and trigger the Bounty Hunter app ( > Multiplayer > Bounty Hunter > Trigger a Bounty). Then simply hide in the HQ, and wait for your target to come. Warning: It seems Ubisoft has patched this. You can’t trigger a bounty while inside your HQ, and you can’t go back in until you’ve finished the bounty. Thanks to TheViper4Life for pointing this out. More often than not, the target will have another ally with him/her. Killing them will not count towards this trophy (it will be shown on the screen whether the hunter has an ally with them). The same as Natural Born Killer , but now the other way round where you are the hunter. In order to get the trophy, you have to get the final blow on the target. If the target is on foot, try to run them over for quick kills. Don’t get out of the car, otherwise the Police will most likely get the final kill. Don’t forget that other players will be after the same person, and the target can also have an ally/co-op partner with them. To find a target, choose > Multiplayer > Bounty Hunter > Find a Target. To launch co-op missions, press > Multiplayer > Online co-op. Once a game has been found, finish the level off in order to unlock this trophy. I’m unsure whether you have to complete the mission from start to finish, or if you can join midway through for this to pop. Completing Dedsec Events counts towards this trophy as well. You will need the upgrade APB: Suspect Located before you attempt this trophy. Once you have the upgrade, fast travel over to the Tie Dye Dude Kiosk in San Francisco. Once there, look behind you to find a Donut store along with a man dressed like a donut (he will spawn from around 8/9am onwards). Highlight him with then press to call the Police on him. To invade another player, press > Multiplayer > Hacking Invasion. Once you are in the player’s game and you are close/in their general vicinity, press to start the hack. Now the player will start running around trying to profile you. If you are found, you will have to escape the area. More often than not you will get profiled, but if you are patient enough you will come across a new player/player that is away from the console, making them an easy target. To get a 100% profile, try to blend in with the surroundings. If you are driving, don’t drive something that is uncommon. Also, drive normally. 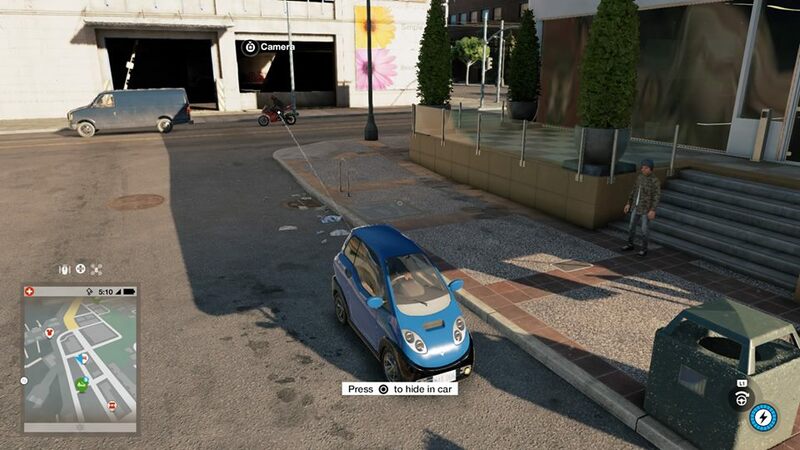 You can also park up on the side of the road and press to hide in the car, but this sometimes doesn’t work, so keep on the move with the traffic, keeping in the area of the player. For the hack to count it has to be 100%; you can’t have a partial hack. You will have to buy the ScoutX app from the app store within your phone before you can attempt this trophy. Once bought, open it up and tab to the home screen ( ). In the home screen, you will find plenty of locations for you to take pictures of. Select a location to place a waypoint on the map. Fast travel there (using the nearest fast travel point) and pull your camera out to take the photo. Some of them will only be available at certain times. If you have the Feeding Frenzy trophy, the donut-disguised man will be permanently unavailable. You can buy cars at Total Motos and Auto Elite. The cheapest dealer is Total Motors. Fast travel to any one of them and head towards the icon. To buy cars, press to open the menu. By the time the story ends, you should have enough cash to buy all these cars, but if for some reason you don’t, there are money bags (blue $ icon on the map) scattered across San Francisco. Alternatively, you can do some quick races to make the extra money. Also, the items that you pick up from the gloveboxes of cars can be sold in the Pawn Shops. Note: You can’t buy the same car over and over again. Once bought, that car will be grayed out. You must buy 25 different cars. Note: Buying boats counts towards this trophy. Very early on in the story, you will come across a side mission to race in eKarts (small electric 1 seater cars). Acquire a better Processor (the trophy will unlock here). In order for this to unlock, you don’t need to finish first in any of the races; just complete them. After this is complete, eKarts races will become available to you. You can do this as soon as you wake up after the beach party. You need to buy the Quadcopter from the 3D printer at any Hackerspace HQ before you can attempt this trophy. The Quadcopter will cost you $67,500. Using the nearest fast travel point in Dolores Park HQ, head to a guy who will make the drone races available to you. The quickest one to complete will be The Palace course. You don’t need to beat the time in order to unlock this trophy; just complete it. There are bikes races scattered across San Francisco. Fast travel to any one of them in order to start a race. Once there, press and you will be given a number of races, the quickest will be the Downtown Dash course. Complete (you don’t have to win) the race in order to unlock the trophy. Note: You don’t need a bike in order to complete this trophy. This is a side mission that is unlocked after meeting Raymond Kenny. Marcus is required to infiltrate Alcatraz to break someone out. Story related, and cannot be missed – Side Operation. This trophy is primarily here as an easter egg for those who have played the first game. The mission can be found as an operation intel in a restaurant in The Tenderloin (Chinatown) area of San Francisco (launch your Quadcopter and press to find it). Whether this is an easter egg I don’t know. The trailer in question was never shown at E3. 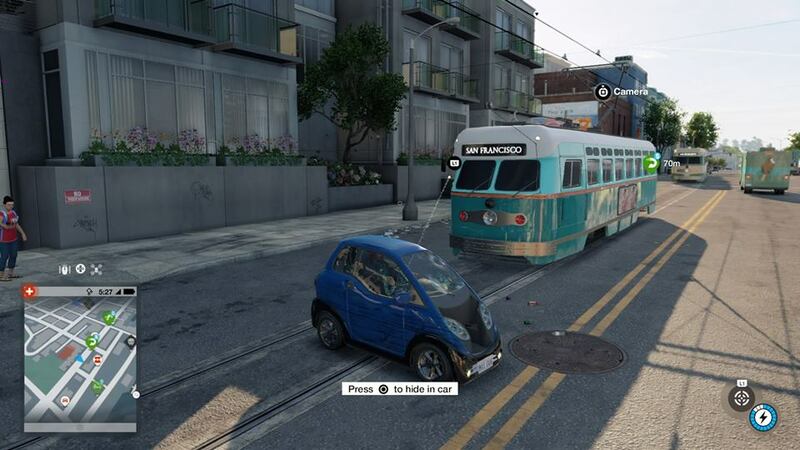 This is a side mission in the game where the operation intel can be found in Silicon Valley near the Nudle building. However, the person in question can spawn in different places. Once you’ve gained the intel, Marcus then has to hack a server and you will be shown a new game trailer (of sort). This is the final mission of the game. You will get a point of no return notice; however, once the mission has finished, and the credits have rolled, you will be returned to free roam to carry on doing whatever you please.